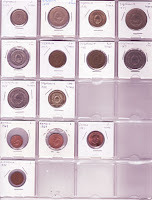 I sometimes get coin collecting questions from customers, friends, or I run across them on the Web. I wanted to take some time to discuss a couple of recent questions that I think will benefit others who are getting into coin collecting. What are the 2 sides of a coin called? Most people know the 2 sides of a coin as "front" and "back", or "heads" and "tails". But the proper numismatic terms for the 2 sides of a coin are obverse (heads/front) and reverse (tails/back). Telling the obverse from the reverse isn't always easy, though. In some countries, such as the United States, Great Britain (along with Canada, Australia, New Zealand, etc. ), and Venezuela, there is a person on the obverse (which is why we often call it the "heads" side). Some countries put a national symbol or seal on the obverse, such as Russia, Ukraine, and India. In contrast, on the Euro it is the reverses which mostly look the same (except that the denomination changes), and some countries (like Italy and Austria) have a completely different picture for each obverse. Singapore - which side is the "front"? For some other countries, it isn't easy to tell which side should be considered the obverse, and which the reverse. 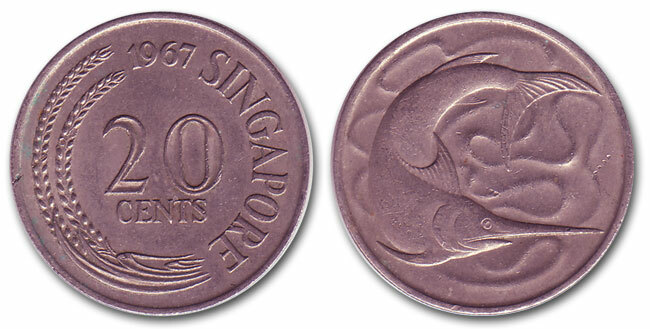 Older coins from Singapore, for example, had the denomination on one side and a picture (animal or plant) on the other. There was no common picture or symbol to offer a good clue as to which side should be considered the "front". In those cases, I usually consider the side that has the country's name on it to be the obverse. I've not yet run across a situation where it mattered which side of the coin was the obverse, so I wouldn't be too worried if you can't decide which side is which. When displaying coins in a collection, I prefer to put the side I like better in the front - it doesn't matter if it's the obverse or the reverse. How should I organize my coin collection so I can easily add to it? One option is to keep your collection in coin boxes which are specially made to hold 2-inch-by-2-inch flips upright (like files in a filing cabinet). This makes it easy to add new coins anywhere you want. 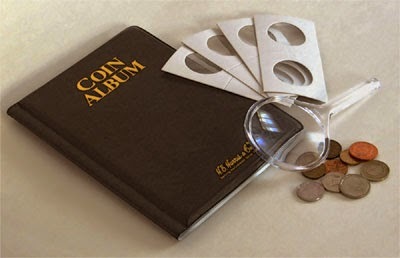 But coin boxes aren't as nice a way to display your coins as binder pages, and it isn't as easy to flip through your collection looking for specific coins. Start each country on its own row. Binder pages (standard, 2x2 size) are made up of 5 rows with 4 coin pockets in each row, to hold a total of 20 coins per page. I start each country on a new row of the page. This lets me add coins to a country by only moving the coins in that country (at least until I have too many and they run into the country on the next row). You can also take this to the extreme and start each country on its own page - so even if you only have 3 coins from Bulgaria, you've got 17 more spots to fill in with more Bulgarian coins in the future. Leave strategic empty spaces. One of the reasons that starting each country on its own row helps is because that usually leaves you a few spaces on the end to grow into. If you have 5 coins from Chile, they take up 4 spots on one row and 1 spot on the next - leaving you 3 more spots to add coins from Chile. Even if you want to add a new coin to the front, you only have to move the 5 coins you already have, not every coin on the whole page. If you have 4 or 8 coins, leave the entire next row empty to grow into.You can also leave empty space at the beginning of a country, so that coins can be shifted either forward or backward, and even in the middle of a country (especially if you know that there is a coin you don't have, such as a 5-Euro-cent coin from Ireland, that could go in that spot). Yes, leaving empty spaces in your collection means that you'll use more pages than are absolutely necessary, but you'll save yourself a lot of time shifting coins later on. Don't be afraid to start a new page. If you have 3 Saudi Arabia coins on the last row of a page, and you get 2 new ones you need to add, it is sometimes easier to start a whole new page (and maybe move all the Saudi Arabia coins to it) instead of shifting everything on the next page to make room for one new coin. It requires less coin shifting, and leaves you with strategic empty spaces to grow into. Use binder pages with thumb cutouts. All binder pocket pages should have openings in the top (or sometimes on the side) to slide your flips into. Some also have a small cutout (sometimes called a "thumb-cut") on the opposite side of each pocket. This cutout is used for pushing a flip out of a pocket so that it is easier to grasp and remove, and it is a definite time- and finger-saver when you need to shift coins around in your pages. If your binder pages don't have thumb-cuts, you can add your own with a sharp knife or scissors by cutting a small rectangle or triangle out of the bottom of each pocket (but please be careful - this should be done by adults only). Wait until you have several coins to add. Because it takes time to shift coins around in binder pages, you might want to wait until you have several coins that need to be added before tackling the job. For example if you wait until you have 3 coins from Japan to add, you only have to do the shifting once. Even with these tricks, it's still a time-consuming process to add new coins to binder pages. I like the way the binder pages display coins, so I'm willing to put in the time to keep it organized. Is it better to collect older or newer coins for a specific KM number? KM numbers are a coin numbering standard created by the Standard Catalog of World Coins, where each different coin for each country gets a number. For example, the 3-pence coin from Great Britain from 1937 to 1948 has a KM number of 849. In 1949, the 3-pence coin was changed (the obverse, reverse, and even the edge changed), so in the catalog it has a new KM number (873). KM numbers allow coin collectors to refer to a specific coin with more precision than just country, year, and denomination might allow. When collecting, you may only want to collect one of each KM number - the 1940 and 1941 3-pence coins are identical, except for the year, so do you really need to have both of them in your collection? Since KM numbers can span multiple years, the question becomes: of the coins with the same KM number for a country, is it better to have an older coin or a newer coin? For Great Britain KM# 849, which is the 3-pence coin from 1937 to 1948, would it be better to have one closer to 1937 or to 1948? Condition. Having a coin that is in better condition is usually more important than having one that's a few years older. If there is a significant difference in the quality of the 2 coins, the better-looking coin is probably the one you should keep. If the age difference is large (20 or more years), then the older coin, even though it is in worse condition, is probably better. Mintage. Mintage is the number of coins that were made in a particular year. 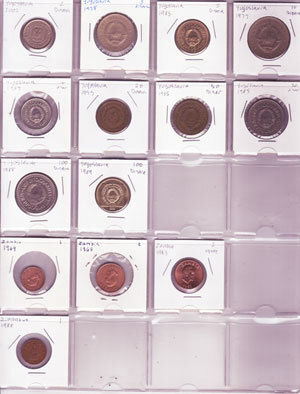 This information can usually be found in the Standard Catalog of World Coins and some online coin collecting sites. A coin from a year with a lower mintage can be slightly more valuable than from a year with a higher mintage because it means there were fewer of those coins made. For our example coins, the mintage for the 1937 3-pence coin was 45 million and for the 1948 is only 5 million, so there are 1/9th as many 1948s as 1937s. In reviewing the mintage information in the Standard Catalog of World Coins, it's been my experience that the first year of a new design - in our example, the 1937 3-pence coin - often has a very high mintage compared to the years after, so it is often less desirable to have the first coin of a new design. If you have a way of reviewing mintage numbers, then for a particular KM it's usually better to collect the year that has the smallest mintage - but keep in mind that low mintage doesn't always mean higher value. Value. If you have access to a coin catalog like the Standard Catalog of World Coins, then you should also consider the coin's estimated value when determining which coin you should keep. According to my 2004 catalog, the most valuable year for Great Britain KM# 849 is1946. Of the 1937 and 1948 we're trying to decide between, the 1948 coin has the higher estimated value. Even though the values given by the catalog are from 2004, it still lets you compare the relative value between coins - if one coin is estimated to be more valuable than another, it will probably stay that way. If you don't have easy access to the mintage or value estimates for your coins, then my suggestion is to aim to collect better-looking coins instead of older coins for the same KM number.